Solo outside the circuit. Today the flying conditions were good! 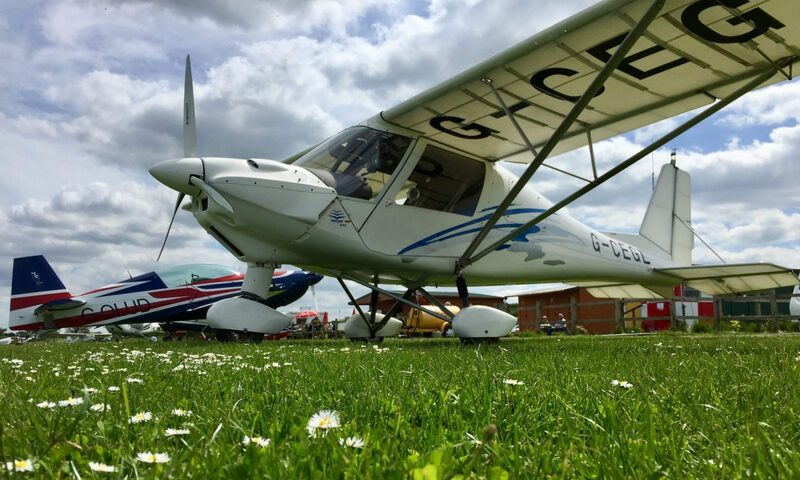 Today the flying conditions were good and this was confirmed by the fact that the numbers of available car parking spaces at the club were limited! As I parked up I saw a couple of aeroplanes I did not recognised taxiing up towards the clubhouse and I saw Simon busy refuelling after his lesson. 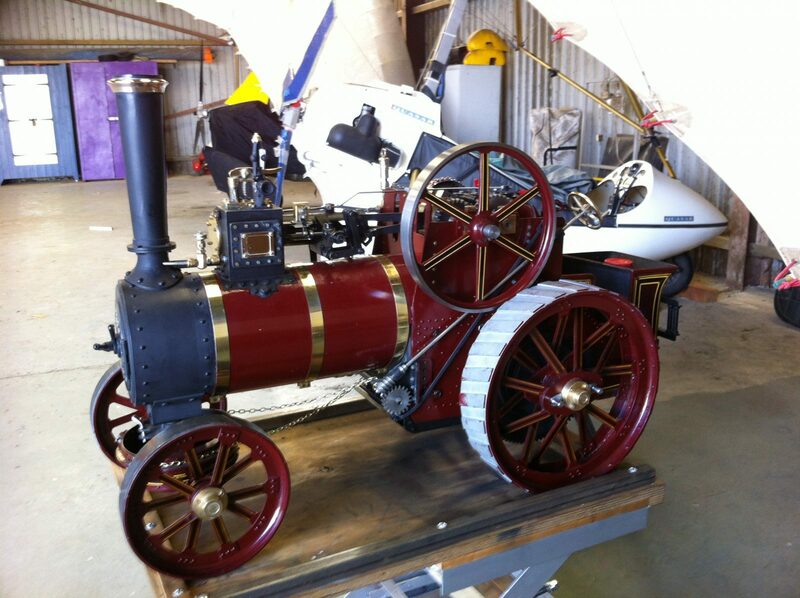 A number of people where stood in the hangar looking at a steam engine Pat had built, it is indeed a fine piece of engineering. As I went around to the club house Mike was in deep conversation with someone I had not seen before, so I went into the clubhouse and it was just as busy inside. As I walked in I was offered a cup of tea, which I gratefully accepted. 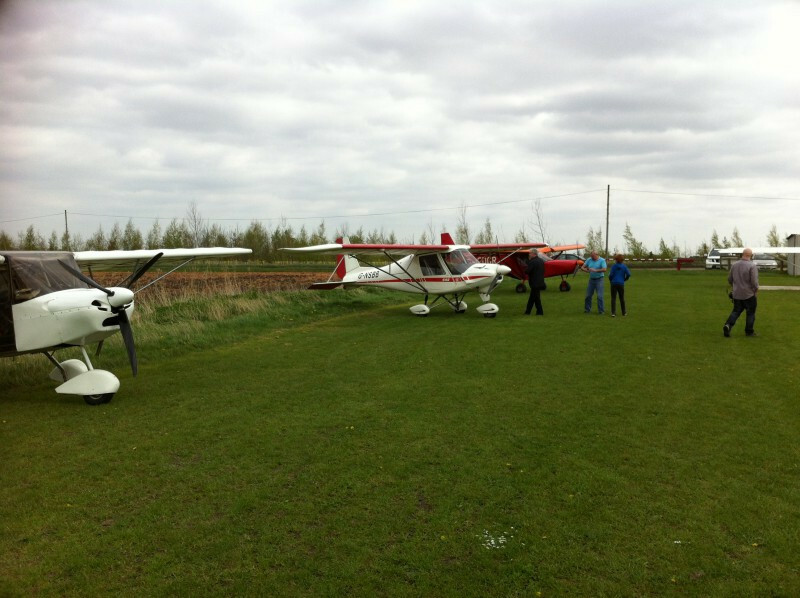 I stood talking with one of the people who had just arrived in a Zenair CH70 Microlight, the other aeroplane was a Skyranger Swift also a Microlight. It was soon time for me to check out the aeroplane before my lesson, all was ok with it and Simon had kindly filled passed the 30ltr mark by 3 or 4 litres. It is something Simon and I need to get better at as I did the same after my lesson by only by around 2 ltrs. Back in the clubhouse Mike outlined today’s lesson which was a quick circuit or 2 and then I was to fly out to the drains and practice flying on my own, keeping the aeroplane on a chosen heading and height to be decided in advance by myself, the reason it was to be chosen in advance was to ensure I practiced accurate turns and controlling the height. We flew the circuit without Mike telling me the turning points and I landed ok unsure if I was to do a second circuit or not I asked Mike just after touchdown and thought he had said yes, so I put the power on, but he soon corrected me and I throttled back and taxied back to the club house. It was now time for me to do my first full solo including leaving the circuit fly around and finding my own way back to the airfield. One thing that always plays on my mind, is how I can be sure if all the parachutists are down before landing as I often don’t hear the “all canopies down” call, Mike gave me some pointers i.e. if the parachute plane is sat in the middle of the runway they are not down however if its parked then they most likely are, but added if I was unsure then radio and ask. So I was now in the aeroplane alone and was waiting for the parachutes to descend before myself and 3 other aeroplanes could taxi out and take off. The first two went and I was next as the 4th had only just started up, I taxied out to runway 24 and took off, I climbed up to 2,000ft and turned to the east and flew out to the drains. Far beneath me at circuit height and to my left were Mick and Thomas who were flying along the drains also. I flew up towards where the drains narrow at Downham Market and turned around and flew back down the other side, then as I got nearer I looked out to try and find Chatteris airfield, having spotted where it was I turned and flew the route again, but this time at 3,000ft and then a descending turn and continued descent back down to 2,000ft, I did this a few times and was tempted to take a few pictures, but thought better of this on my first solo outside of the circuit! Time was soon up and I flew back down the drains, turned towards Chatteris and descended to 700ft, circuit height, were the parachutists up or down!? 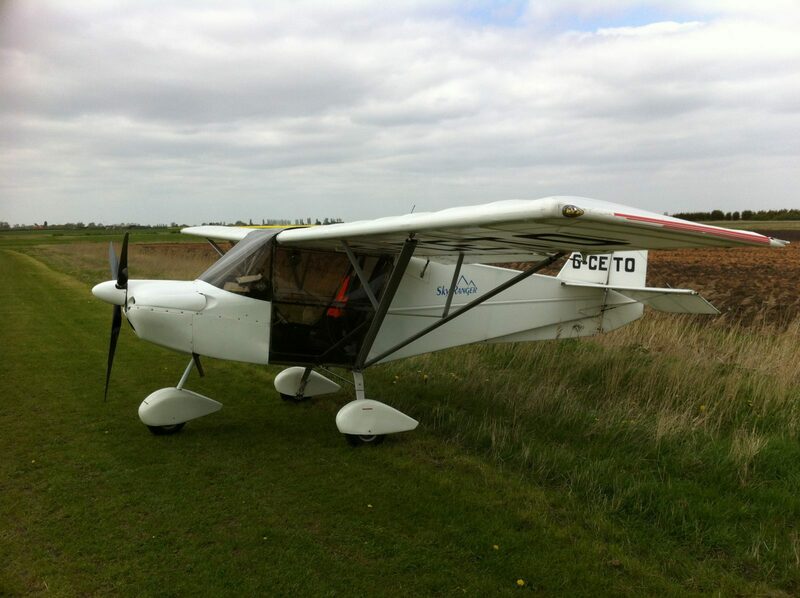 As luck would have it I saw their aeroplane climbing out so I knew it was safe, I carried out my normal checks and saw another Microlight on the taxiway. 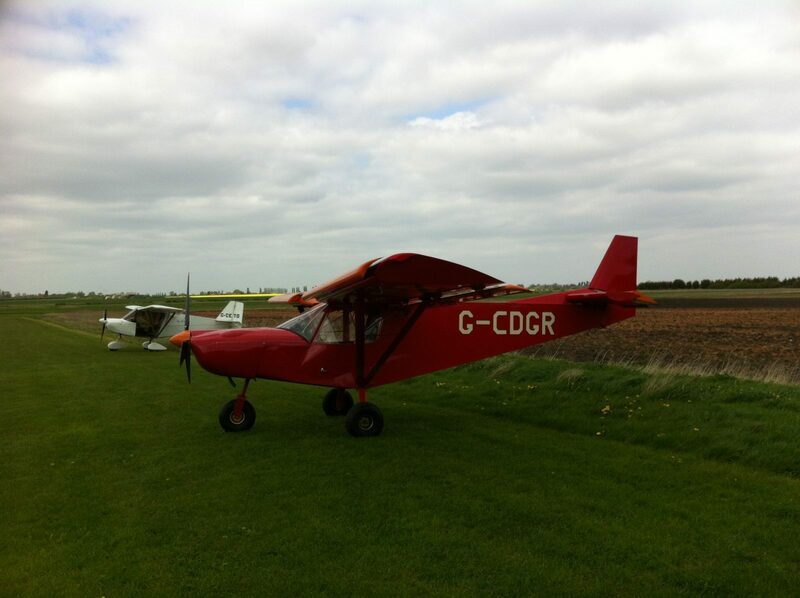 I made my joining call and Mick in the other Microlight call that he was lining up for immediate departure and was gone long before I turned on to final. I made my final call and lined up with the runway, which I then needed to correct. As I came into land I held the aeroplane above the runway trying to keep it flying as we are taught and it seemed to hang or rise slightly for a split second before a very gentle touch down, probably the second most gentle I have done, and I felt very pleased with the landing. As I continued down the runway the nose came off the ground a couple of time which I had not experienced before and I meant to ask Mike about, I assumed it was a combination of the lighter weight, full flaps being on and the wind. However on my return to the clubhouse I was asked “how was it?” and I said it was good “and the Landing?” I said it was good too, the approach could have been better lined up, but the landing I was pleased with, I asked why and Katie said it look as if I had bounced, which I hadn’t, maybe the wind caused it to balloon slightly, but if so from in the cockpit it did not seem so. I wanted to discuss this with Mike, however he was in deep conversation, we did discuss it briefly after and he said if it balloons I should go around. I have relived the landing a number of times and to me I can still not explain what they saw from the clubhouse as for me in the cockpit it seemed a good landing! Thus I left feeling puzzled and confused. 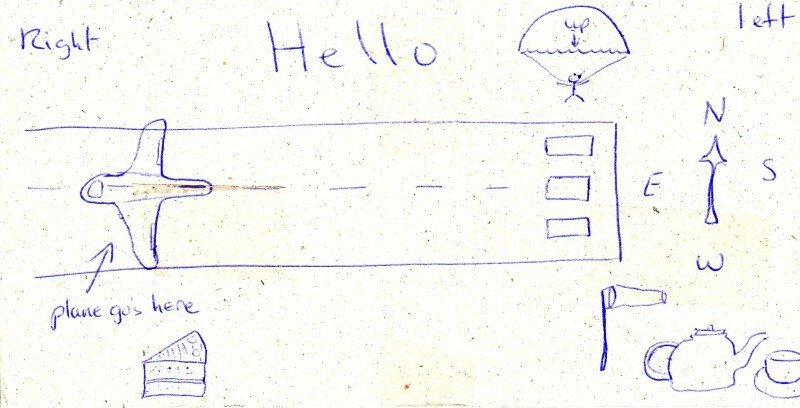 On another and lighter note a friend who reads this blog sent me some stuff and it was taped to the card pictured below which summarises my learning to fly through his eyes! Plane goes here, relating to not getting it in the middle of the runway; Compass with the wrong points, to me having miss read it; windsock to all the gusty wind; the parachutist, my concern over knowing where they are; Left and right the wrong way around, I haven’t worked out, maybe he is confused! and lastly tea and cake he believes is the real reason I go flying! I think it’s a fair summary of all the issues i have faced! I try to give the real feeling I have and not the “haven’t I done well” approach some blogs take. We all need to get better at this, last week the person before under filled by 1 or 2 ltrs this week I over filled by a couple or so… maybe there is a training course we can go on! Previous PostPrevious I’m leaving the circuit!